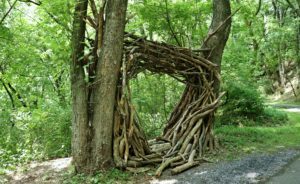 This month, step into a world of nature, wonder, and creativity when you visit the Art in the Wild exhibits at Wildwood Park in Harrisburg. 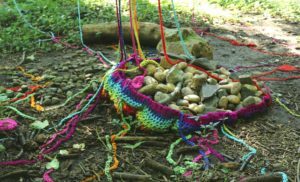 This unique event is made up of artists, both professional and recreational, who create installations along the park’s 3 mile walking path which strive to become a part of nature. “We really encourage the participants to use materials on site; it is after all an opportunity to create these artistic installations in the environment of the park and to make them blend with the park as much as possible,” says Jim Caufield, Art in the Wild Committee member. Now in its seventh year, Art in the Wild began as a curious dream eight years ago. 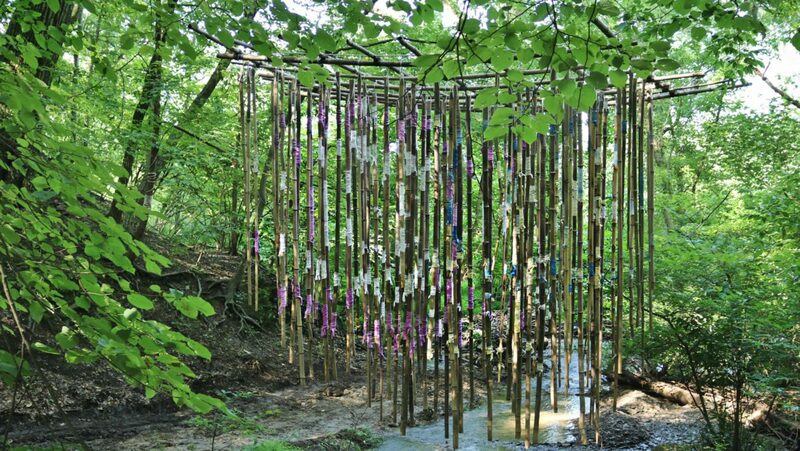 In 2012, Elizabeth Johnson, part of the committee at Wildwood, had seen an environmental art installation while traveling and wondered if this beautiful idea could work at Wildwood. After a year of discussing and planning, Wildwood set up its first show. All nine applicants were accepted, and the naturalistic art event was well on its way to popularity. “All of the original committee members were very proactive in the idea that it should be public art,” says Donna Curanzy-Seltzer, another committee member. According to Caufield and Curanzy-Seltzer, the crew at Wildwood came up with three main criteria for Art in the Wild. Art in the Wild would provide good public art; that the program would involve the community; and that it would provide educational opportunities. With these in place, Wildwood makes sure that the exhibit is open to anyone, with no restrictions on age, profession, or experience. This year’s theme is “Playful”. Out of the 11 applicants who entered, ten have been chosen. Every year a jury evaluates each application and also chooses the judge that will assess each installation to determine the top three winners. Artists submit anything from written proposals to scaled down models of their ideas; the more detailed the better. 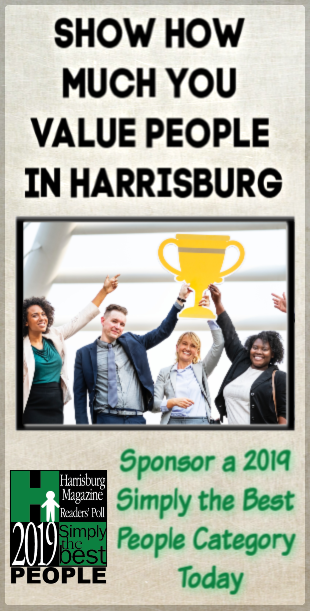 While many of the past judges have been from out of state, this year, the event will be overseen by local sculptor and professor at Messiah College, Ted Prescott. There will be a few days of activity and judging takes place on April 11. Awards are given at a small ceremony the next day. Prescott will speak on how the works of other artists have inspired him and how nature plays a role in his own sculptures. The prizes awarded to the first, second, and third place winners come from donations given specifically to Art in the Wild. The exhibits will be open to the public from April 13 until October 31. “An interesting side of these exhibits is, at the end of seven months of being outdoors, subject to storms and rain and animals and even visitors, falling apart is part of the art. What I always recommend is get out there as soon as you can in April, look at these exhibits in their new, fresh, pristine state, and then come back periodically and watch them deteriorate, because they will,” says Caufield. “There is a certain kind of beauty in that deterioration and we have always had an understanding that it’s part of the process,” Curanzy-Seltzer says. The public can check out all ten unique installations that will be sprawled throughout the park. More information is available inside the Olewine Nature Center. Photos of each installation will be displayed in a binder, a video made by students at Capital Area School for the Arts Charter School (CASA) will be shown, and maps detailing each artist and exhibit will be available. Don’t forget to vote for the People’s Choice awards by scanning the QR codes found at each site, or by voting through paper ballot in the Nature Center. Wildwood Park is located at 100 Wildwood Way, Harrisburg, PA. Hours of Operation: Park – Daily from dawn until dusk; Nature Center – Tuesday through Sunday, 10 am – 4 pm.